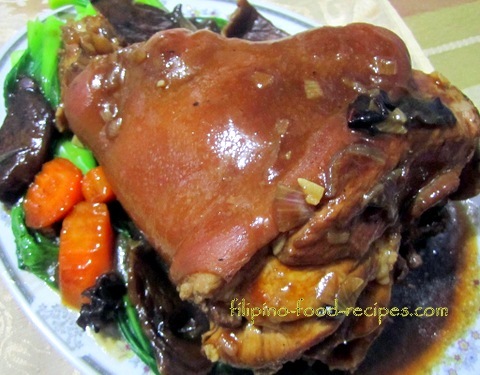 Patatim is a Chinese-style dish of ham hock or pata cooked in a slightly sweet gravy with mushrooms and vegetables. Ideally, the ham hock is browned in the pan before braising, but this is quite a challenge because of oil splatter. So I boiled the pata in seasoned broth separately before sauteing the other ingredients for the sauce, then just put them together. I also used dried black fungus or mushroom that I reconstitute, together with shitake mushrooms, but use whatever you have or like. 2 Boil the ham hock with the marinade and enough water to simmer for about 2 hours or until tender, (or pressure cook for 30-40 minutes). 3 Saute garlic, onion, ginger and star anise and the sliced mushrooms. 4 Add the carrots and oyster sauce, and about 3 cups of liquid from boiled pork. 5 Thicken the sauce with the cornstarch slurry. 6 Put the pata back in the pan and baste it with the sauce (or spoon the sauce on top). Turn the heat off. 7 In a separate pan , blanch the taiwan pechay by boiling enough water and cooking for a minute, then drain and shock in ice water to stop cooking and remain crisp. 8 Arrange the pata on a platter, together with the pechay, carrots and mushroom on the side and pour in the sauce. 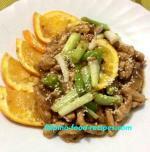 9 Serve with steamed white rice and enjoy!